Mike's Tree Service was formed for the purpose of removing dangerous trees, lot clearing, view clearing, pruning and stump removal. Mike's is licensed, bonded and carrying one million in insurance. Our CCB#4729. We offer "senior rates" and free estimates. 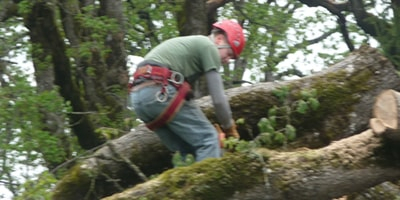 Call us if you have an emergency tree removal. We offer 24 hour service. We serve the entire Portland Metro Area including the West Hills, Beaverton, Tigard, Lake Oswego, Sherwood, Multnomah and Clackamas Counties.